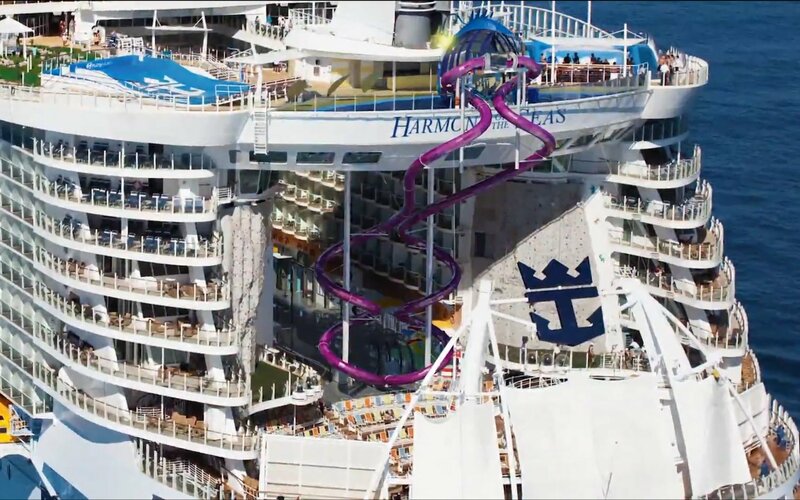 How the 1% will sail around: on the Harmony of the Seas, the world’s biggest cruise ship ever. Finally after 40 months of engineering, the luxury ship was handed over by a French shipyard to the Royal Caribbean Cruises Ltd (RCCL). In true style, a spectacular ceremony was held in Saint Nazaire for the handover, complete with tightrope walkers and acrobats. Just how big is it? At 66.5 meters wide and 362 meters long, it’s even longer than the Eiffel Tower in height. The cruise ship cost about 1.132 billion USD to build, which includes its 18 decks that can carry 6,360 passengers and 2,100 crew members. It took 2,500 workers to build the ship for a total of 10-million work hours that began in September 2013. Some of the attractions for its lucky passengers are a 10-storey slide, a giant climbing wall, surf simulator, floating Jacuzzis and mini golf. If that wasn’t impressive enough, the cruise ship also has a casino and a 1,400-seat theater that plays Broadway musicals. If you need to stretch your legs after that, well that’s what the ‘Central Park’ deck is for. Still not that impressed? You’ll change your mind when you get poured a drink from the robot barmen. The first official voyage will commence on May 22 from Southampton in southern England to Barcelona. Go on, treat yourself. This Week in Travel: Waking Up With a Hangover… and Flight Tickets to the Maldives?